I used to absolutely love sims freeplay as it was the only sims game I had. 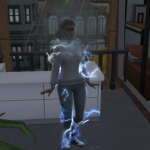 Now that I have TS4, I've realized how many bad qualities the game has. In reality, the major features ruin the game. Quests are my least favorite part of the game. You have to spend tons and tons of simoleons for some quests, and you can't get anywhere in the game if you don't try to complete them. Parts of the game are locked until you complete the quests. So much for "freeplay". Actions took REAL TIME!!! Plus, it took like 4 hours to read a book. I know they want you to come back and keep playing but at least make it realistic!! Anyway, the game is a mess. It could be a good game... if it wasn't the sims freeplay.